1 REQUIMTE/LAQV, Department of Chemistry and Biochemistry, Faculty of Sciences, University of Porto (FCUP), Porto, Portugal. 2 Life and Health Sciences Research Institute (ICVS), School of Health Sciences, University of Minho, Braga, Portugal. 3 Department of Medical Sciences, Internal Medicine and Gastroenterology Unit, Catholic University of Rome, Gemelli Hospital, Rome, Italy. 4 Acute General Medicine, John Radcliffe Hospital, Oxford, UK. Address for correspondence: Luís Moreira Gonçalves. Departamento de Química e Bioquímica, Faculdade de Ciências, Universidade do Porto. Rua do Campo Alegre, 687 – 4169-007 – Porto, Portugal. Phone: (+351) 220 402 646. E-mail: [email protected]. We report the clinical case where the sudden onset of a Cotard syndrome in a 69 year old lady lead to the discovery of a multifocal glioblastoma in the right temporo-parietal lobe. Cotard’s syndrome is a rare psychiatric disorder in which the afflicted patient believes he or she is dead. These nihilistic thoughts are the expression of a rare syndrome first described by Jules Cotard in late XIX century. The Cotard’s syndrome has been studied and it seems that its psychopathology can be ascribed to the temporo-parietal cortex. Although the Cotard’s syndrome is not part of the DSM-V it is common in psychiatric literature and is included in ICD-10-CM within code F22. It has been described associated with organic lesions and atrophy of the non-dominant temporo-parietal cortex, in pathologies like bipolar disorder, schizophrenia1, subdural hemorrhage2, multiple sclerosis, brain atrophy3 and cerebral infarction4 among others5-7. We observed the case of a female patient, 69 years old, with no relevant past medical history, that was admitted to the John Radcliffe Hospital in Oxford (UK) with an episode of numbness in the left hand and an episode of dizziness whilst at home, duration of symptoms was of 15 minutes and then resolved entirely. She had no history of head trauma. Neurological exam was unremarkable and the stroke team felt a CT scan was not required, however she failed occupational therapy assessment and was not sent home. During the night she developed the delusion of being dead. No signs or symptoms of depression were apparent, she also denied any history of recent or not so recent affective or psychotic disorders. Moreover, her mini-mental state examination was unremarkable. Thus she seemed to have developed a type I Cotard syndrome. Cotard’s syndrome is a uncommon neuropsychiatric condition in which the afflicted patient believes he or she is dead8; the type I reflects the absence of depression, anxiety or hallucinations, it is closer to constitute a pure Cotard syndrome whose nosology may be more delusional than of an affective disorder9. Figure 1. Brain MRI showing a multifocal GBM mainly in the right parietal lobe. 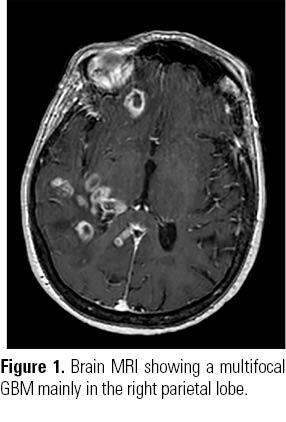 A head MRI with Gadolinium was then performed that showed multifocal lesions within the brain likely in keeping with a primary brain tumor (Figure 1). “There are multiple heterogeneously enhancing lesions within the right parietal lobe and superior temporal gyrus, which cross the midline just posterior to the splenium of the corpus callosum. These demonstrate mixed diffusion characteristics with predominantly restricted diffusion and low signal on gradient echo imaging consistent with necrosis. Conclusion: Appearances are suggestive of neoplastic process with necrosis, most likely a primary glial neoplasm (multifocal GBM). Metastatic deposits remain within the differential but are less likely given the imaging characteristics”. A chest/abdomen/pelvis CT scan showed neither primary tumor nor any metastatic disease. The patient was started on oral dexamethasone after the MRI result, as suggested by the neurosurgeon. As a result, the Cotard delusion disappeared in the following day. She was then discharged and referred to the neuro-oncology service. She undergone a brain biopsy a few weeks later which was consistent with WHO grade IV glioblastoma. There is only one case reported in literature associating a brain tumor to this syndrome, it was published in 1993 and it tells the clinical case of a 12 year old boy with a parietal lobe astrocytoma10. To the best of our knowledge this is the first reported case of a Cotard’s syndrome caused by a brain tumor in an adult, and for obvious reasons, this seems to be the only known case where this syndrome was successfully treated by means of corticotherapy not requiring the normal approach with antidepressant and/or antipsychotic drugs. This manuscript corroborates the assumption that one should keep a low threshold for organicity when finding a Cotard’s syndrome6. Morgado P, Ribeiro R, Cerqueira J. Cotard syndrome without depressive symptoms in a schizophrenic patient. Case Rep Psychiatry. 2015;2015:643191. Perez DL, Fuchs BH, Epstein J. A case of cotard syndrome in a woman with a right subdural hemorrhage. J Neuropsychiatry Clin Neurosci. 2014 Winter;26(1):E29-30. Chatterjee SS, Mitra S. “I do not exist” — Cotard syndrome in insular cortex atrophy. Biol Psychiatry. 2015;77:e52-e3. Sottile F, Bonanno L, Finzi G, Ascenti G, Marino S, Bramanti P, et al. Cotard and Capgras syndrome after ischemic stroke. J Stroke Cerebrovasc Dis. 2015;24(4):e103-4. Pearn J, Gardner–Thorpe C. Jules Cotard (1840-1889): his life and the unique syndrome which bears his name. Neurology. 2002;58(9):1400-3. Swamy NCK, Sanju G, Mathew Jaimon MS. An overview of the neurological correlates of Cotard syndrome. Eur J Psychiat. 2007;21(2):99-116. Najjar ES, Santos JPMd, Chaves AC, Pitta JCdN. A case report of Cotard s syndrome with catatoniform symptoms. J Bras Psiquiatr. 2014;63(4):384-5. Cotard J. Du délire hipocondriaque dans une forme grave de mélancolie anxieuse. Ann Méd Psychol. 1880;4:168-74. Berrios GE, Luque R. Cotard’s syndrome: analysis of 100 cases. Acta Psychiatr Scand. 1995;91(3):185-8. Bhatia MS. Cotard’s syndrome in parietal lobe tumor. Indian Pediatr. 1993;30(8):1019-21.